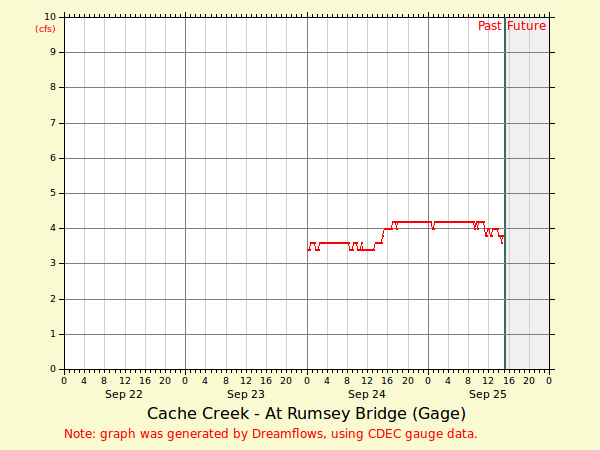 Cache creek is one of the largest streams in Lake County. The South Fork begins at Clear Lake and parallels Route 20 then turns south adjacent to Route 16. Indian Dam and Reservoir supplies water to the North Fork. The South and North Fork converge at Wilbur spring where natural hot springs can be found. Bear Creek is the main tributary and its mouth at Cache Creek is a hub for whitewater activity. 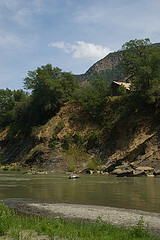 The Grigsby Riffle is a natural rock ledge near Rumsey Bridge (take-out for the lower whitewater run on Cache Creek) and this area limits the amount of water released from the dam upstream. The ledge slows water drainage and can create flooding at higher flows. A large part of Cache Creek was designated a Wildlife Area by the State of California and the BLM and in 2006 a large portion of the creek and its surroundings was deemed Federally protected Wilderness. Most of the whitewater activities enjoyed in the summer is supported by water release from upstream dams for downstream agriculture in Yolo County.